The annual doctoral colloquium of the Evangelische Theologische Faculteit, Leuven, presents two promotions – one on a linguistic study of the Gospel of John, and another on Frederik Fransons’ Missiology –, an inaugural lecture from New Testament Professor Jacobus (Kobus) Kok and a festive evening honoring Prof. Dr. Patrick Nullens as outgoing rector. 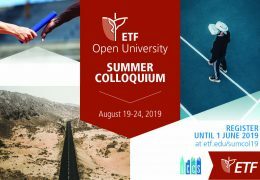 The annual highlight of ETF’s PhD program is its colloquium when all doctoral staff and students come together at ETF’s campus for feedback on research projects, graduations, and various activities to stimulate research. 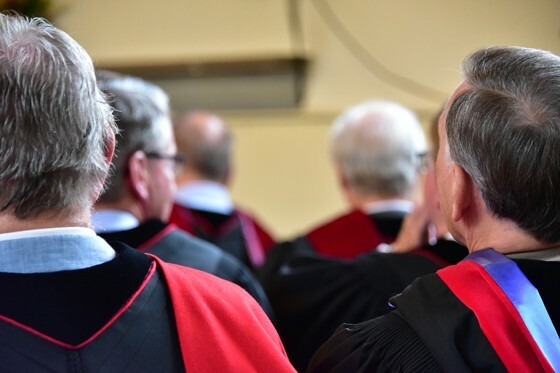 This year’s theme is “Building Bridges, Past, and Present,” reflecting on how theological areas of participants can and do promote rapprochement, in past and present, among Christians or between Christians and others. At present, thirty-nine international students from twelve different nationalities (Belarus, Belgium, France, Germany, Indonesia, Malawi, Netherlands, Ukraine, Syria, Switzerland, USA, Zambia) are working on doctorates at ETF. Clemens Wassermann lives near Stuttgart in Germany with his wife and their four daughters. 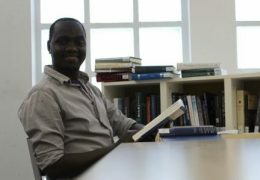 Currently he is involved in theological training and revision of Bible translations. On September 6, Hans Ulrich Reifler (CH) will defend his thesis “Zur Missiologie Frederik Fransons (1852-1908): Eschatologie, Missionsmethodik und Transnationale Vernetzung.” The dissertation investigates the life and work of Frederik Franson (1852-1908), a Swedish-American revival evangelist, mission mobilizer and mission strategist. This study examines the influence which Franson’s eschatology, mission methods and transnational networking had on his missiology and his missionary work. The dissertation argues that Franson’s eschatology motivated him to such an extent that within 22 years numerous churches, fifteen faith missions, and four free church federations emerged as a result of his restless ministry. Franson also implemented new methods of missionary work: follow-up meetings for new converts in Europe and evangelization courses as an instrument to recruit new missionaries. In addition, Franson’s life and work are reconsidered in the light of prevailing transnational connections in politics, economy, and religion. This examination leads to the question of his relevance for his time and for today. 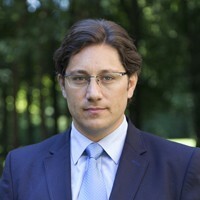 Reifler’s promoter is Prof. Dr. Christof Sauer (ETF Leuven). Hans Ulrich Reifler, born 1949 in Basel, studied Theology in Basel and Vancouver. 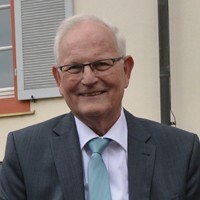 From 1976-1991 he served as a missionary with the Swiss Alliance Mission in Brazil, and from 1991-2014 as a lecturer at St. Chrischona Theological Seminary, Basel. 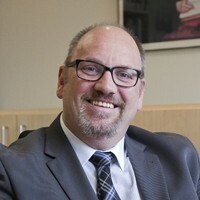 He is married to Karin Grösser. They have four children and ten grandchildren. On September 4, 2018, Prof. Dr. Jacobus (Kobus) Kok will give his inaugural lecture entitled “Drawing and Transcending Boundaries in the New Testament and Early Christianity.” Prof. Dr. Kok (ZA) joined ETF Leuven in September 2015 as full-time Associate Professor in New Testament and was promoted to Professor in March 2018. In his lecture, Kok will explain that Early Christian identity construction involved the process of determining inclusive and exclusive boundaries with regard to identity, ethos and ethics. Kok uses cognitive metaphor theory to discern how two early Christian documents, the Odes of Solomon and the Gospel of John, reflect similar yet distinct efforts to establish these boundaries in the first centuries of the Common Era. 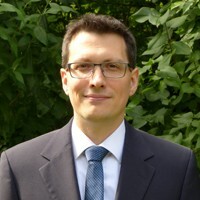 Kok is main editor and project leader of the books Sensitivity to Outsiders (published with Mohr Siebeck, 2014), Insiders versus Outsiders (Gorgias Press, 2014), and Leadership, Spirituality and Discernment (Springer, 2018), as well as the author of several monographs related to this research topic (including New Perspectives on Healing, Restoration and Reconciliation in John’s Gospel, Brill, 2017).